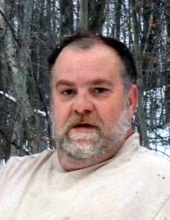 Randy J. Abair, a lifelong resident of St. Albans, passed away at the age of 57 with his family by his side. He lost his battle with cancer. Randy has been driving a dump truck for most of his life. He worked for years for I.H. Charbonneau and Son before purchasing his own truck. He started his own business, Abe’s Trucking, and sub-contracted through J.A. McDonald. Randy loved to hunt and will be missed by all of his great friends that he is leaving behind. He is going to be missed by his daughter Samantha Abair and her boyfriend David Wilson of St. Albans and their son Lincoln Wilson, his son Joseph Abair and his wife Krista and their daughter Mallory, his brother Terry Abair, and his sister Candy Hope and her boyfriend Mike, his niece Alicia Hope and her fiancé Cody and a nephew Forest. He will also be missed by his beloved canine companion Reba, whom he spends his days with. He was predeceased by his parents, Ernest and Irene Abair, his sister Mary-Ellen Abair, and his canine companion Rachel of 13 years. We would like to thank his nursed Jeanne, Hanna, Sophia and Emily from the Franklin County Home Health who took such great care of him during his final months. A Mass of Christian Burial will be celebrated Friday, August 17, 2018 at 10:00 AM in Holy Angels Church. Interment will follow in the Abair family lot in Mount Calvary Cemetery. The family will receive condolences on Thursday, August 16 2018, from 7:00 to 9:00 PM in the Brady & Levesque Funeral Home, 86 South Main Street, St. Albans. Memorials may be made to the Franklin County Home Health Agency, 3 Home Health Circle, St. Albans, VT 05478. Arrangements are entrusted to the Brady & Levesque Funeral Home, where online condolences and memories may be shared with his family and friends at: www.bradyandlevesque.com. To plant a tree in memory of Randy Joseph Abair, please visit our Tribute Store. "Email Address" would like to share the life celebration of Randy Joseph Abair. Click on the "link" to go to share a favorite memory or leave a condolence message for the family.